Is there anything better than the first produce from your own garden? We harvested half a dozen radishes from our community plot, the very first vegetables we pulled from the ground this season. Radishes are ancient, dating to pre-Roman times. 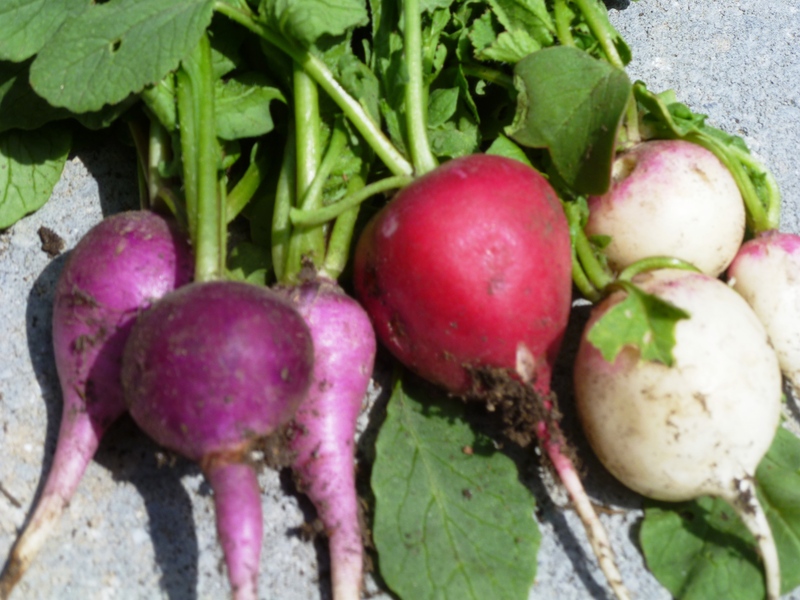 Radish means “quickly-appearing root” in Latin, which it is verily. Scatter the seed with a light soil covering and, voila, within days the first green shoots appear. We usually plant a rainbow of radish, to better enjoy the many variations of a veg that offers hints of mustard, horseradish and wasabi. This year we sowed Red Head (snow white with red caps), Purple Plum (bright purple skin with white insides), Ping Pong (all white, hence the name) and German Giant (bright red skins with white insides, said to be sweet till baseball-sized … though we are not likely to test that theory). I am also partial to Easter Egg mix, which is a colorful blend of many varieties of radish. I don’t know how the Romans prepared their radishes but this is what we did with the first harvest: Sliced paper thin, lightly sprinkled with salt and prettily arranged atop a salad. This reminds me of a memorable radish pairing. At the Againn gastropub in Washington, I enjoyed an incredible potted pork confit with onion marmalade served in a small crock, alongside a salad of organic lettuces with shaved radishes which were inside-out, pink inside with a white border. This was an ecstatic pairing, and I had to go back a second time to make sure it was as delicious as I remembered. A dish like pork confit is best eaten in restaurant where a chef prepares it perfectly. But a mixture of pungent greens and radish – anyone can put a beautiful plate of that on the table. Bon appetit! I agree: radishes are amazing! Delicious and so easy to grow–everyone should have a patch, even if it’s just in a window box! My favorite way to eat them is in slices atop tiny squares of bread and butter. Yum. It’s near Metro Center, 11th & New York Ave. Enjoy!